Want a hot air balloon ride near Raleigh, NC? A hot air balloon ride in the Raleigh, NC area is a one of the most beautiful adventures anyone can experience. We're glad to help you find the right hot air balloon ride to fit your goals and expectations. 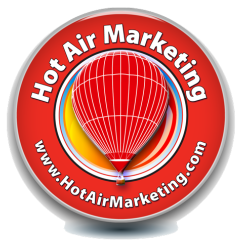 While Hot Air Marketing is primarily focused on corporate, public relations and community relations oriented hot air ballooning, we do offer some private balloon rides for passengers on occasion because we are ambassadors for hot air ballooning. However, if you have a very tight time schedule for your desired flight, we are delighted to refer you to a pilot in our region. Please take a moment to look at the following list of just a few of the things to consider to maximize your balloon flight. For referrals or general inquiries about flights please complete the Inquiry Form at the bottom of this page, so we may better help get your started on your ballooning adventure. How much does it cost for a hot air balloon ride? In Raleigh and surrounding areas of central North Carolina, the typical price for a hot air balloon ride is between $260-$360 per person depending upon the hot air balloon pilot and the time of year. Most pilots require a deposit at the time of booking. Hot air ballooning is a team effort and every pilot will have crew members assisting during the flight. Tips for crew are encouraged and customary, but are not required. Weather is everything. Hot air balloon pilots don't fly unless the weather is right. If the weather isn't right for flying or the comfort level of your individual pilot, the pilot will tell you that there is always time to wait for better weather. Hot air balloons only fly the first two hours after sunrise and the last two hours before sunset as winds are less stable during the middle of the day. If you have your heart set on flying during the middle of the day, we recommend you look into some other form of heavier-than-air type of flying. You have to be in reasonably good health. If you've had surgery (especially orthopedic related procedures), you should wait to heal - typically one year after your doctor has cleared you for more strenuous activities. If you're a "seasoned citizen" answer the question for yourself, "If you were to jump from the top of your kitchen chair to the floor, would you hurt yourself?" If the answer to this question is "yes" it is very likely that hot air ballooning is not for you. Passenger weight matters. The total weight of the passengers is important. The hotter the weather, the less weight the hot air balloon can carry. So, when your pilot asks you how much you and your fellow passengers weigh, be honest. It's for your safety (and the pilot will keep it a secret anyway). Children. Different pilots have different policies about flying minor children; some do not fly minor children while others do. Some pilots have a minimum age requirement. In general, most children should be tall enough to see over the edge of the basket - about 48 inches or taller - in order to enjoy the experience. After all, if they can't see the beautiful sights, they'll get bored. Have a conversation with your pilot about your particular child and his/her maturity level. Note: Hot Air Marketing typically will not book un-tethered flights for minor children under 17. Remember, hot air ballooning is an outdoor activity with inherent risk of serious injury or even death. Your pilot will ask you to read and sign a Waiver of Responsibility. Be sure to read and understand it carefully. It is important that you understand the risks associated with hot air ballooning before, during and after the flight. Unlike flying in a fixed wing plane or helicopter, hot air balloons often do not take off or land at airports. More likely, you'll find yourself in the midst of a beautiful country or suburban setting. Be prepared for an outdoor adventure. Do NOT fly in a hot air balloon if you are pregnant or think you might be pregnant. Who is the primary contact for this flight? Must be 18 or older. if "Yes," please make sure that the person you intend to surprise actually has a desire to fly. You don't want to be disappointed if that person doesn't wish to go. Please note: Depending upon the total number of passengers (typically if more than 3 or 4) and the combined weight of the passengers, more than one balloon may be required. Most people have a special event tied to their balloon experience, tell us what's special about your flight. Please select the option that best describes the ages of the passengers for this flight. Yes, we're of age and would like a traditional champagne toast. No, we'd like a non-alcoholic option for our post-flight toast Some of our passengers are not of legal drinking age, please have champagne and a non-alcoholic option.